Having a child is a blessing and it brings joy to the whole family but when it comes to baby care, parents need to make sure their baby receives the best possible care in every aspect of life. In the early ages, wooden swings were commonly used by the parents to put their baby to sleep. Nowadays, baby swings have transformed enormously and are much more advanced with the inclusion of technology. Swings makers are using different ways to increase the comfort level of the swings for the newborn babies by innovating features which are very effective in calming the baby. Swings contain various items from toy bar to the rocking option and they are helping parents in putting their baby to sleep without putting an extra effort. Modern swings are coming various forms and it is indeed a headache to find the right product. There are various categories of swings in the market and each one of them possess a unique set of features. Parents often find it annoying to find the best suitable swing for their child as there are lots of swings and many of them are similar with little difference in prices and features. We have compiled a list of swings to help parents in providing the accurate information on the best swings currently available in the market within the budget. Below is a list of the 06 best baby swings one can get under $100 which offers features like the lightweight frame, high comfort level, durability and innovative soothing features. Graco is among the best seller in the product category of baby swings on Amazon and is a well-reputed company with a vast range of baby care product range. They maintain high standards in terms of quality and safety in all of their products. Graco swings are usually the first choice among new parents because of the innovative features and user-friendliness. This swing frame design is compact and made of a good quality material which is strong, light in weight and has a neat and sleek design. The seat and headrest also have fine quality fabrics used in it which are perfectly stitched and washable. This swing comes with 3 soft toys, 15 different songs and side to side motion which helps in soothing the baby quickly and effectively. It has a nice and cozy material used in its seat and headrest which is soft and comfy for the baby. It is also spacious enough and can easily sustain a baby up to 30 pounds weight. It has a compact frame structure, which is very light in weight and gives parents the option to lift it easily. It has a very simple folding procedure which increases its portability. This swing comes with the plug-in option which helps you to save money on battery purchase. However, if you want to take the swing out of the house and want to sit with your child in the garden then you`re in luck because It also has a 5D rechargeable batteries option which gives 4 hours backup. The price for this baby swing is around eighty-three dollars which is a good deal to avail as it has so many cool features. Graco offers this swing with compact frame design and AC Plug-in option which is great. It also has 3 soft toys and has 15 different songs and 5 nature sounds option. For the safety purpose, this swing comes with a 5-point harness. Ingenuity is a well-known brand of Kids II company and has a wide range of products. It maintains a good quality standard and has a good market reputation and consumer satisfaction. It offers products with smart functionality and is intuitive and versatile. Ingenuity offers three different color options for this product and each color has a unique theme which matches the design and gives it a nice look. It is a gender-neutral product and the styles it used in detailing are very attractive. Build quality of this product is also neat and sleek. The major factor which influences any parents purchasing decision of swings is its comfort. They always give priority to it and make sure that it provides best possible comfort to their child. This swing comes with a good range of options and has 2 soft toys, 8 calming melodies, 3 nature sounds and soothing vibes. Families living in apartments often face difficulties in carrying and transporting swings to the park or the nearby places because of the excessive frame weight and unavailability of the folding option. Well, this swing has the solution to this problem because it comes with a slim foldable design which makes this swing easily portable and also storable in spaces like a car trunk. Usually, swings come with the battery with low running time and it often feels annoying to the parents to replace the battery frequently. This swing provides a better option because it comes with a 4D battery option which has an extended running time and lasts up to 24 hours. It is 3 times more than the usual ones because it has the Hybridrive technology which enhances the capability and provides additional running time. 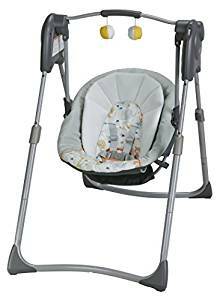 The price for this baby swing is around ninety dollars which is fair because it has both swing and vibration option and also the Hybridrive technology. Ingenuity offers this swing with an easy lock option (swing 2 Seat) with an extended battery time that lasts up to 24 hours. This swing also has 5 different swing and vibration options along with 8 melodies & 3 nature sounds. It also has a unique auto shut off option which is quite effective. Bright Starts is a well-known brand of Kids II company. It has a different range of baby-related products and it also maintains a good consumer reputation. Young parents prefer to opt for the unique designs and they prefer to select the swings with cool colors and features. This swing offers more than just that, it has the option to convert the swing into the adorable rocking seat easily just by lifting the seat from the frame. The frame structure of the seat also has an anti-rocking option. This swing has one stand out feature which is the major reason why it is included in our best under $100 category and it is the weight sensing technology which means that the baby`s favorite speed will remain consistent, even as baby gets bigger. The seat cushions are made up of soft fabrics and can be adjusted in three different positions in both modes. This swing also has the entertaining function with both calming and nature sounds and its WhisperQuiet technology ensures that the baby will swing in silence and without any motor noises. Many modern swings often don`t put the adjustable toy bar which can be annoying as it comes in the way when the baby is taking in and out of the swing each time. This swing has a perfect solution for this annoyance because it comes with the adjustable toy bar which can easily be adjusted to any position. It also has a foldable structure and can easily be folded and carried in a car. This swing comes with the plug-in AC adapter which is very convenient can be used to avoid the hassle in case you run out of batteries. It also has a 4 C batteries option which gives backup up to 24 hours. 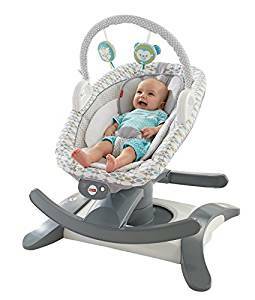 The price for this baby swing is around ninety-nine dollars and ninety-eight cents which is a good deal as it has both WhisperQuiet and Weightsensing technologies. This swing offers an option to convert it into a rocking seat. 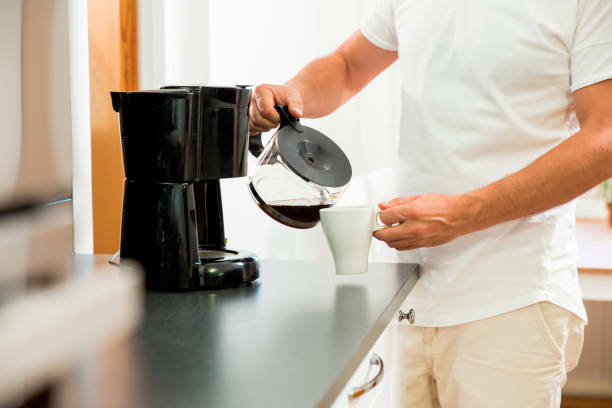 It also has the Weight-sensing technology and a swing timer with three different time settings. The seat of this swing also has 3-position recline and an AC plug-in option. Fisher-Price is a well-known company with its strong consumer satisfaction rapport in the market. This glide soother is among the company`s successful products and offers a wide range of features in one package. This glide soother design has an advanced 360° degrees rotatable seat which can be easily rotated according to the required position and is made up using light materials. It also has a soft easy-care high-quality fabric used on the seat, headrest and the whole cover which can be easily washed. First thing comes to the mind when choosing between the range of swings or the glide soothers is the level of comfort they are offering. This glide soother takes the comfort to the next level by providing four rock`n glide motions option along with the option to select either head to toe or side to side soothing that help in soothing baby easily and quickly. Along with that It also offers the calming vibration and 12 different musical tunes with 3 nature sounds option to comfort the baby. Many modern swings or glide soothers often don`t put the adjustable toy bar which can be annoying as it comes in the way when the baby is taking in and out of the swing each time. This swing has a perfect solution for this annoyance because it comes with the adjustable toy bar which can easily be adjusted to any position. It also has a foldable structure and can easily be folded and carried in a car. This glide soother comes with the 1 D battery and the AC plug-in option which eliminate the trouble of buying the batteries frequently from the store. The price for this baby swing is around a hundred dollars and so. This is a good value as it has four soothing and gliding motions. This Fisher-Price swing offers this swing with four different rock 'n glide motions feature. It also has 12 tunes with 3 soothing nature sound effects. It also has an AC plug-in option to connect and operate the swing without a battery. Ingenuity company has a good market sense as it has introduced many successful brands. Ingenuity is among one of them and since its inception into the baby care products industry it has grabbed a major market share with its quality produce. Companies introduce innovative features in their products to catch the eye of parents looking for the swings. This swing is made by using super lightweight durable material and it helps decrease the weight of the frame considerably. The whole product is high in quality and maintains good standards. It is also a gender-neutral product with minimalistic design. . The only reason parents opt for the swings and stuff is to provide comfort to their baby without involving themselves all the time. If the swing is unable to provide comfort then it is no good than being thrown away in a basement. This particular swing comes with a mobile that is adorned with 2 adorable plush characters for baby to play and coo with, it also has a good range of options which includes 2 soft toys, 8 calming melodies, 3 nature sounds and soothing vibes. The super lightweight material used in the frame and the wheels inclusion in the base provide convenience for parents to carry it around easily and without extra effort. This swing comes with the 1 D battery option which lasts up to 60 hours. Battery installation is quite simple and can be done easily. The price for this baby swing is around hundred dollars and so. The whole package within this price range is a far deal to avail as it is quite different to average swings in the market. Ingenuity offers this swing with a seat rotating option that rotates the seat to 180 degrees for 3 swing directions. It has 6 different speeds setting and 8 melodies with 3 nature sounds & white noise option. Its Whisper Quiet technology enables the swing to operate without making any annoying noises. It also has touch control panel to adjust settings. As one of the most trusted brands in the baby care product industry, Graco believes that its major reason for success is their products quality in which it maintains high standards. Parents usually prefer to go with the brand with good market reputation because when it comes to the baby, they are less likely to take risks. Parents usually speak highly of Graco products whether they experienced Graco baby car seat or the baby swing. Graco introduces this swing frame design with height adjustable legs, parents can easily adjust the height of the swing by just stretching the legs. The swing seat and headrest are covered with a high-quality fabric and has a very simple design. This swing comes with 2 soft toys that offer visual stimulation to engage the baby. The swing seat and headrest are made using very soft fabric, which feels comforting by a touch. The swing has enough space to easily sustain a weight up to 25 lb. The swing frame is specially designed and has an option to be used in small spaces, It also has a carry handle to lift the swing with ease. The best part of this swing is probably the seat compact folding option which enables you to put the swing in almost any tight space of a vehicle and is very useful for traveling. 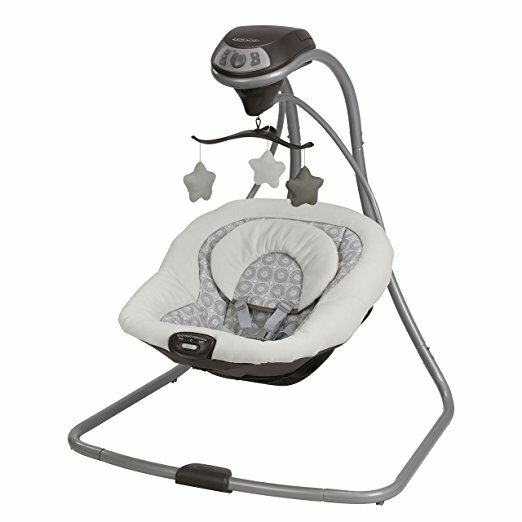 This swing has 4 D batteries and the swing motor is much more efficient as the batteries last up to 6 weeks. Parents also prefer to buy swings that are less noisy as the motor noises make it difficult for the baby to sleep and even wake them up sometimes, this swing has a motor which is incredibly less noisy and smooth. The price for this baby swing is around seventy-one dollars. In this price range, you can hardly get any other swing with these excellent features. So, hurry up and check this product before the prices go high by a surge in demand. 5-point harness in the seat. It also has a removable head support option to wash it with ease. Several brands are introducing innovative technologies to enhance the swings in all the aspects from comfort level to the ease of use, the reason why these brands made it to our list is their unique features and user-friendly design which help not only the baby in comforting but also the parents to operate it with ease. It is obvious that there are products available which are better in features and other aspects than these products but within this price range, we think that this the best swing one can get. Young parents often get confused about purchasing the baby stuff and end up buying the non-suitable product for the baby. So, if you are expecting a little one then you should check these products and if you already have a baby and you are using any sort of swing than you should compare your swing features and price with the above-mentioned products and then decide if the existing swing in which your baby is sleeping is better? Or should the baby need something more comfortable?